I was so blown away with a swipe painting I saw in one of the facebook groups that I had to give it a try. The black paint against the bright colors was just the sort of high contrast look I really like, but could I make it work? I tried out my regular lamp black craft paint and I was also very lucky to find a mars black although it was rather pricey. I mixed all the paints, layered them on some plastic page protectors and carried out side by side comparison swipes using the two black paints. Would either of them work? Would the mars black be essential or could I get a good swipe with the regular lamp black? Check out my video below for the experiment and see the results at the end. Conclusion – yes, you can get this to work with certain colors against a regular black if they are light enough in weight and will float up to the top. However the mars black is a heavier weight paint and will be more likely to give a better result. It’s heavier than the colors in the same way as the titanium white is heavier, so it allows the bright colors to pop up through. Hi ! Do you put one drop of silicone on your black? Is it pure color to do you mix it with floetrol and water. Sorry of you tell on your videos… my english is very poor…. your Book is very nice ! Yes I added 1 drop of the silicone oil to the black paints also. The black is mixed the same as the other paints with floetrol and water, just as if I was making a real painting. Your English is excellent, thank you for leaving a comment. 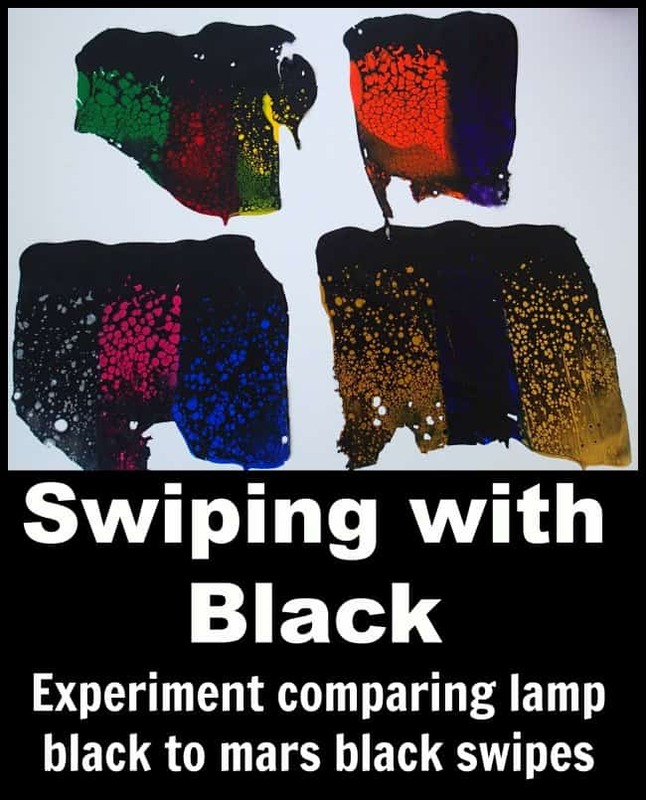 I just got a “sample” of black house paint from Sherwin Williams … LOVE IT… smooth and the colors sit really well in it….. Good advice about the colors of black. Thanks. Do you ever mix blacks out of other colors? Like Raw Sienna, UM Blue and Perm. Aliz.? Many different combinations…. Just wondered. Guess I have a project to do now, eh? How do you know if one paint is heavier than another? Are you referring to soft body vs heavy body? It’s more to do with the pigment density and the weight of the pigment itself, not whether a paint is soft or heavy. Different colors have different weights, titanium white being very heavy. If you add this to your cup you can see it sink down through the other paints. The only company I know of that produces a chart is Golden. You can find it on their website.